And once again, Fantasy Fest nears. Burlesque shows, dog costume contests, drag shows, tutu Tuesday, bodypaint, the smallest parade in the universe… Check out the official schedule here and find your bliss. Hotel booking should be first and foremost, as the event attracts about 75,000 to the island. Don’t be left without a spot! Rooms go fast on the island and you don’t want to miss the festivities. After you’ve booked your room, don’t forget these Fantasy Fest essentials. Playing it too cool during Fantasy Fest and wearing normal clothes will make you the odd man out. Bring a wig, a tutu, a mask; the more ridiculous the better. 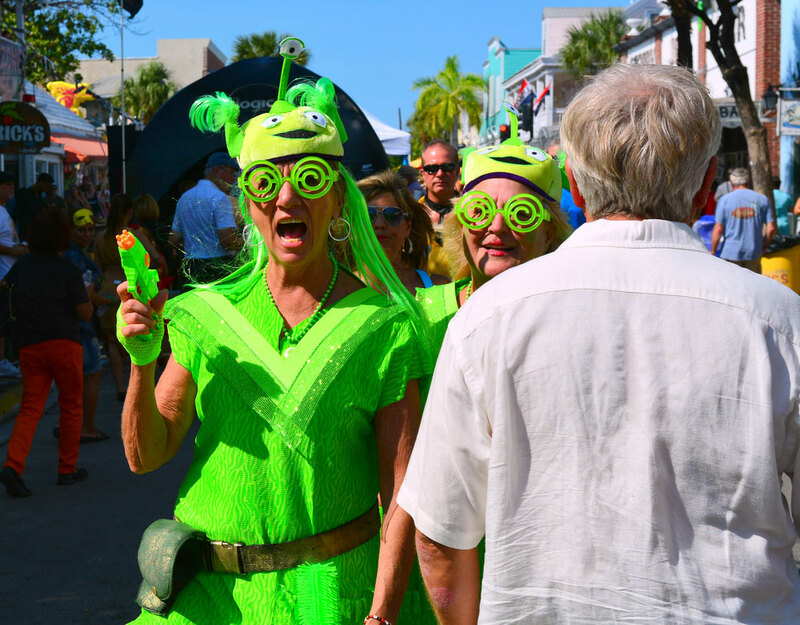 Fantasy Fest is like a 10-day celebration of Halloween mixed with Mardi-Gras, so dress for the occasion. If you come without a costume, Fairvilla in Mallory Square has your back, but prices are on the steep side. If you’re not into clothes (as most attendees aren’t) another option is to paint your skin with whatever persona you desire. Because you won’t stay in just one place during Fantasy Fest street parties and bar hopping, remember to bring cash to purchase drinks along the way. The zone for open container is well marked, and within that area there’s no shortage of drinks for purchase. You never know when the opportunity to swim will present itself in Key West, especially during Fantasy Fest. Bring along a bathing suit under your clothes or, if you aren’t wearing any, pack one in your bag. While it’s the last week of October on the island, the sun in Florida is always reliable. Remember to put on sunscreen if you need it, or maybe your body paint will block out the UV rays. This may seem obvious, but the most important thing to remember with the camera is to keep it at a full charge! Between the costumed dogs, drag queens and revelers, keep your camera charged and nearby to capture all the slaphappy party-goers.